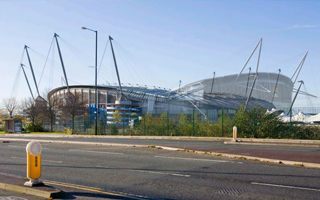 While the south stand’s new upper tier reached its final height, we invite you for a brief journey into past and future of Manchester City’s home. These unique photos show what the stadium looked and will look like. 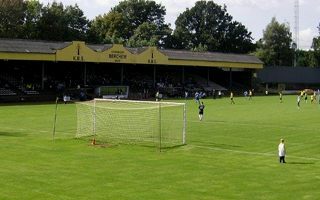 While the new stadium may consume up to half of the Walton Hall Park, it may also offer local community something in return. 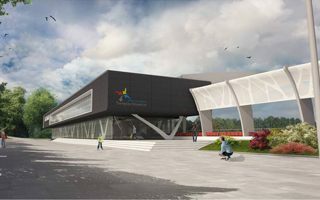 It may revive the neighbourhood and bring commercial opportunities. 28.11.2014 Bucharest: Euro 2020 to become a relief to top clubs? 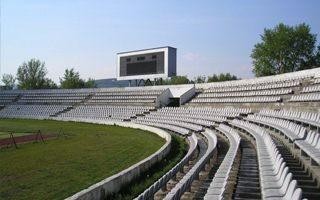 As every host city, Bucharest needs to supply secondary stadiums for training needs. 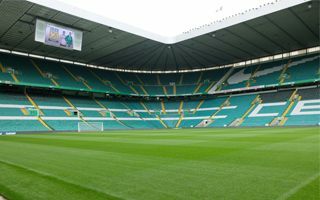 Nominations were handed over to three big club stadia, which are now in despair. It should have been ready for the World Cup, but wasn’t. 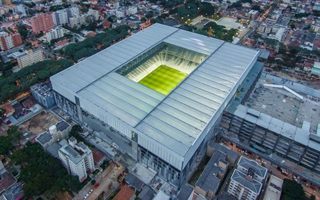 So now work is back in progress in Curitiba to deliver Latin America’s first retractable roof. 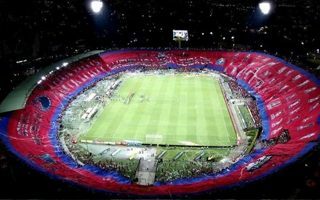 Arena da Baixada to make history again. It’s the single company that refused to sell and has been effectively blocking Tottenham’s new stadium for a decade. Last night it went up in flames. 26.11.2014 Russia: Kaliningrad to be removed from the 2018 World Cup? 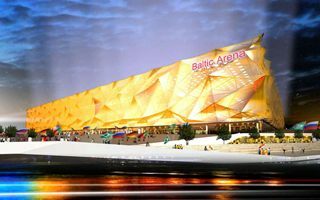 Sports minister Vitaly Mutko threatened to remove Kaliningrad from World Cup host list, if the city doesn’t immediately resolve its stadium problem. Is this threat realistic? Not the national stadium of Qatar any more. 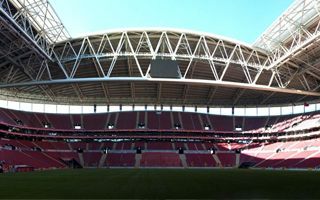 Instead, the largest athletic stadium domestically and one of the best connected arenas worldwide. 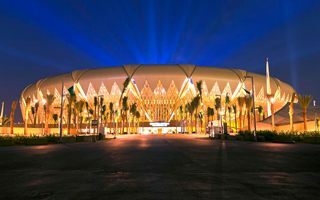 With reduced capacity and impressive new roof, here’s Khalifa Stadium. Officially the largest flag ever presented in a stadium. Unofficially: one was bigger, but too big to present it inside. Anyhow, this one is mind-blowing with 32,000sqm. 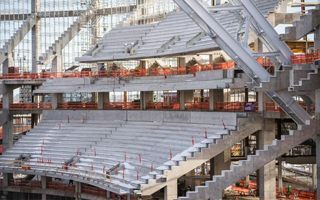 Almost a third of the new multi-use arena in Minneapolis is already standing. First sections of the future seating bowl can already be seen in the east. 700 people are working constantly on the site. The scenario seems just too similar to other disasters at African stadia. 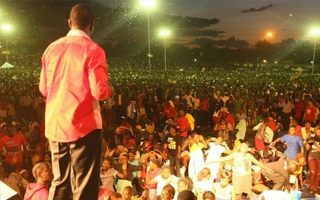 Entry gates closed and panic in the dense crowd resulted in 11 people losing their lives. 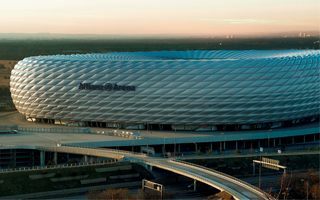 Instead of 2030, Bayern managed to cover all debts associated with Allianz Arena this year, well ahead of time. 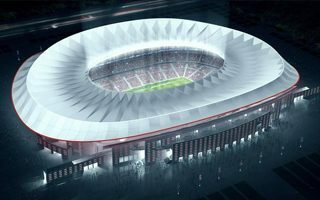 The stadium cost €346 million. 21.11.2014 New design: Sydney to get the world’s best stadium? We know this distinctive stadium bowl very well already. 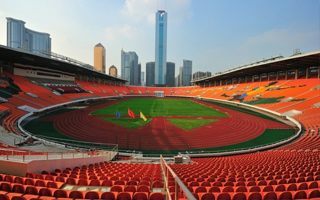 But by late 2018 the host venue of 2000 Olympics may be the most advanced sporting arena ever, offering some stands completely mobile. 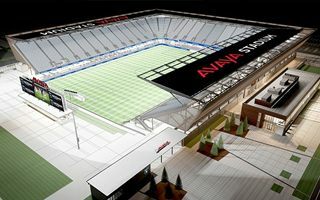 Since Wednesday the new stadium in San Jose is called Avaya Stadium. Money earned on the contract will come in handy as the project’s budget is growing. 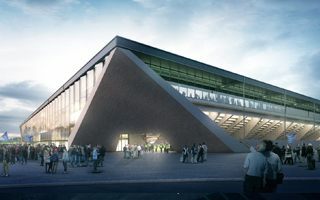 With outcries from local residents the city council in Freiburg supported the new 35,000-capacity new stadium. Now it’s time for the community to vote, referendum is planned for February. Last night saw a hardly satisfying debut of Allianz Parque, seeing hosts Palmeiras lose to Sport Recife 0:2. 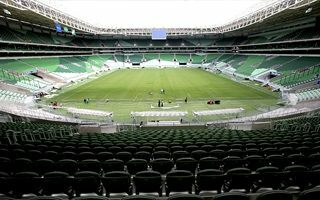 But the stadium is still captivating, just like the one-of-a-kind Estadio Kleber Andrade! 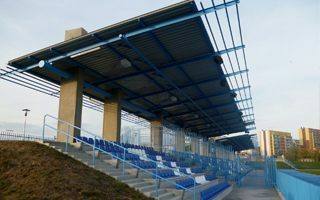 500 seats, substitute bench, safety railings or section signs – all this and more is offered to supporters of Chemnitzer FC as the club prepares to inhabit the new stadium, currently under construction. 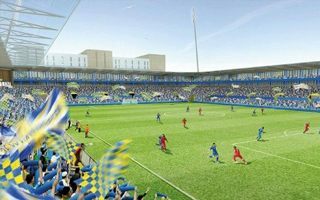 The Merton Council received AFC Wimbledon’s planning application for the new 11,000-capacity stadium. Will works commence in 2015? 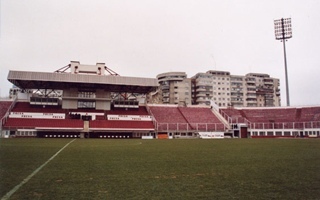 By year end the old Stadion na Sihoti will be no more, or at least not as it used to be. 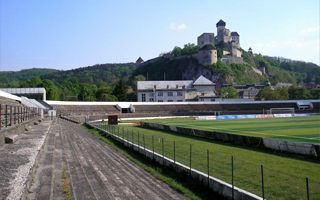 Three stands will be demolished completely as AS Trencin football club wants to build a new 10,500-seater from scratch. 22-year-old Nathan died after being transferred to hospital last night. He fell down a concrete staircase at Celtic Park as he was leaving the ground after 1:0 victory over Ireland. 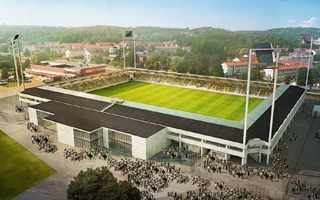 The town’s name is a jaw-breaker for people outside Hungary, but the planned stadium will be very simple. Which is a compliment, because it’s still very well designed! 13.11.2014 Cyprus: Groundbreaking in Limassol in early 2015? 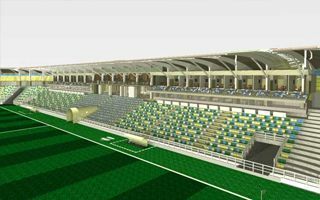 Apollon Limassol chairman assures supporters works on the new stadium shared with AEL and Aris are going smoothly. 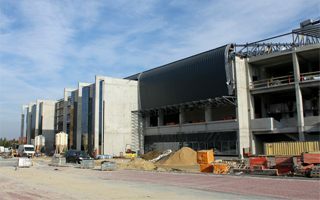 Construction may start in early 2015, according to PhileNews.com. 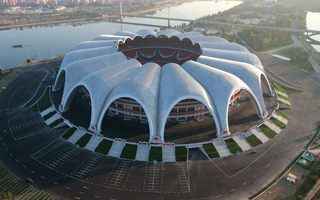 Nobody knows exactly how much it had cost or what the current capacity is, but North Korea’s national stadium is back. After months of complete renovation works it was re-launched into operation recently. 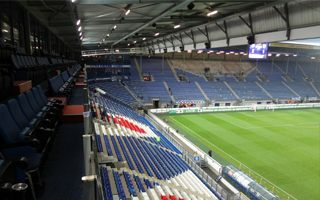 Slovan Bratislava draws just over 1,000 people per game and not even all the time. 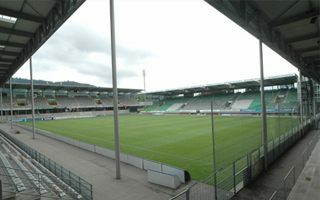 Even the title favourites Zilina fall far short of filling their stadium. 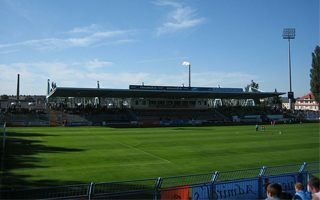 This seasons sees all-time low for crowd size in the Fortuna Liga. 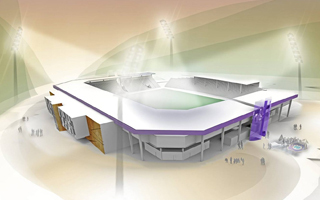 Looking from the right angle, you can see inside it or even through it – the revamped Erzgebirgsstadion in Aue will be cut into two parts. Presentation took place today. 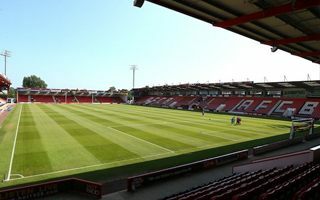 Redevelopment plans for two stands are on hold, so two others will have all their seats replaced in upcoming weeks. Supporters are helping to make the operation faster and cheaper. 09.11.2014 Poland: Private partner to help resurrect Świętochłowice’s sleeping giant? It’s the smallest stadium on StadiumDB at the moment, but only by number of seats. In reality it’s a large stadium, too large for the city to handle. After years of negligence hope may have come to Świętochłowice. 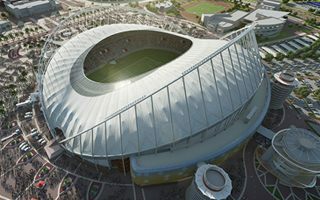 While FIFA never allows the host country to have more than to stadiums per city, they made quite an exception for Qatar. In fact, in 2022 the furthest host venue might be just 30km from Doha. 07.11.2014 2030 World Cup: Chile to bid with or without Uruguay? 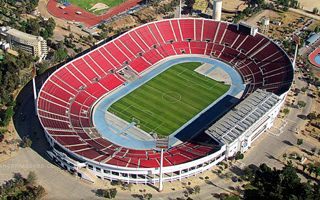 Ahead of upcoming elections, the president of Chile’s football federation proposes to hold the 2030 World Cup in the country. 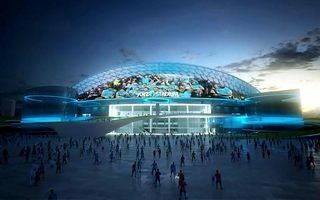 With or without co-host Uruguay, the potential bid was already discussed with FIFA. 07.11.2014 New design: Re-inventing the triangle? This vision from Switzerland makes more use of triangular concrete slabs than we thought were there. A very refreshing look at simplicity, but how will supporters welcome the proposed solutions? Answer coming up in 2019. Was due to open in 2014, 2015, then 2016. Now the delivery date has been postponed until mid-2017. 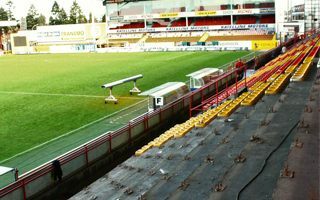 Estadio La Peineta still has some question marks over financing model. 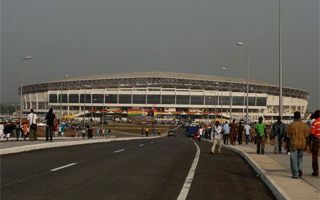 Though only 6 years into operation, the stadium in Sekondi-Takoradi urgently needs renovation works. Meanwhile the government halted funds even for regular maintenance. 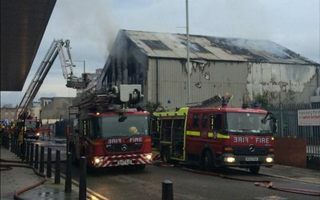 The roof is falling off, steel is covered with rust and roads and sewerage are cracking. 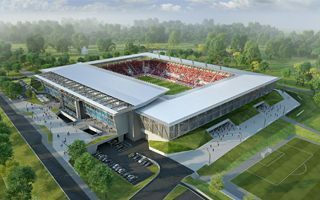 After two years in progress, the new municipal stadium for Tychy is taking its final shape now. 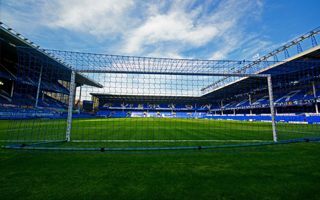 Future home of GKS has most of its roof in place and floodlights are now being installed. 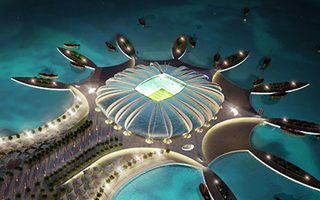 Largest global contractors are competing for unprecedented deals to build 11 stadiums across Saudi Arabia. With $4.4 billion of contracts up for grabs, the stake is higher than ever. 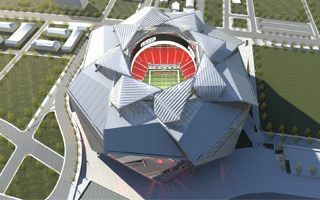 The High Court of Georgia will hear the case of taxpayers vs. the city of Atlanta over financing of the Falcons Stadium. Construction will not be stopped whatever the outcome, but financial structure of the project may be at stake.